1. 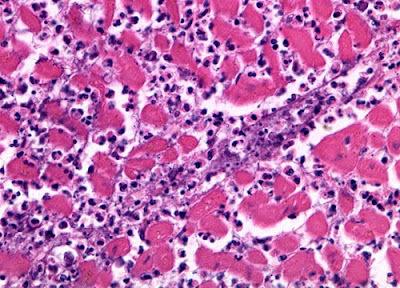 On the basis of the histopathology, could the infarct have been present seven days before the death of the patient? Why or why not? Answer: The infact could not have been present seven days before the death of the patient. The changes of neutrophilic infiltrate and coagulative necrosis are compatible with an acute myocardial infarction. At seven days, the infarction should show early fibrovascular changes and the presence of macrophages. 2. Why do the myocardial fibers in the subepicardial and subendocardial areas appear normal? Answer: The myocardial fibers in the subepicardial and subendocaridal areas appear alive because they are still viable and due to the acute nature of the process, have not yet begun to show changes of coagulative necrosis. 3. What causes the hemorrhage? Answer: The hemorrhage is caused by damage to intramyocaridal bood vessels (necrosis) with resultant interstitial hemorrhage. 4. Why have the polymorphonuclear leukocytes not infiltrated all the dead fiber bundles? Answer: The neutrophils have not yet infiltrated all of the dead fiber bundles, as a result of the acute nature of the myocardial infarction. Coagulative necrosis (loss of cross striation, loss of nuclei, smudgy hypereosinophilic cytoplasm) occurs at around 8-24 hours. The neutrophilic infiltrate does not commence until around 24 hours. 5. At which stage of infarction is the risk for myocardial rupture the greatest? Why?